Hillary Clinton is leaving the answers to all questions about the controversial “C.P. 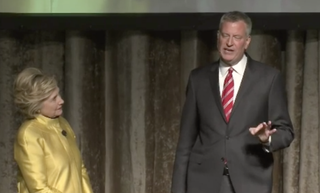 Time” skit she did with New York City Mayor Bill de Blasio to de Blasio himself, distancing herself a bit from the matter, the New York Times reports. “It was clearly a staged show. It was a scripted show. The whole idea was to do the counterintuitive by saying ‘cautious politician time.’ Every actor thought it was a joke on a different convention. That was the whole idea. I think people are missing the point here,” de Blasio said on CNN on Monday. His office later released a statement adding, “In an evening of satire, the only person this was meant to mock was the mayor himself, period. Certainly no one intended to offend anyone,” Cosmopolitan notes. Read more at the New York Times and Cosmopolitan.